According to Census 2011, Uttar Pradesh has an urban population of 44.47 million people – which is 11.79 per cent of the total urban population of the country. The state has 653 urban local bodies (ULBs) including 17 Municipal Corporations (Nagar Nigams), 198 Nagar Palika Parishads and 438 Nagar Panchayats. 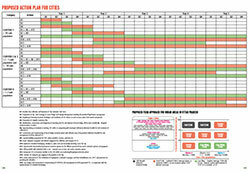 The ULBs, with their limited local resources and state support, are responsible for provision of municipal services. A sanitation snapshot of urban Uttar Pradesh clearly indicates that households with onsite sanitation systems (see Box: The three pathways) like septic tanks (47 per cent) far exceed those with sewer connections (28 per cent). According to the State Annual Action Plan 2017, most cities have reported more than 80 per cent coverage of latrines, but out of the 60 AMRUT cities, 34 have reported zero efficiency regarding collection and treatment of sewage. This study is available in two volumes. 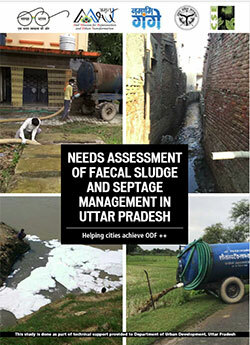 Volume 1, 2nd edition (Managing Septage in Cities of Uttar Pradesh- An analysis of the sanitation chain in 66 cities, through SFDs) briefly describes about each stage of sanitation chain, analysis through cluster SFDs and also proposes action plan. Volume 2, 2nd edition (Assessment of excreta management- Factsheets for 66 cities in Uttar Pradesh), on the other hand is a compilation of SFD factsheets of each of the 66 cities. Both these volumes were recently released at the CSE’s Annual Media Conclave – the Anil Agarwal Dialogue 2019, which was attended by 100 journalists, environmentalists and experts from all over India, coming together in a state-of-the-art symposium to discuss, debate and demystify the year’s key issues of environment and development.